I’m guessing that just about everyone who has ever even dipped a toe into the realm of diorama building has, at one time or another, come up with the totally unique concept of a vehicle or small group of soldiers on a country lane. Sure, not really that unique but that doesn’t mean not worthy. If you think about the last time you saw an episode of Band of Brothers you’re probably picturing an award winning dio in your head right now. Well, MiniArt from Ukraine has done you a favor. They have taken the concept and translated it into plastic for us all. MiniArt, always expanding their many different lines of plastic pleasure, has released another in the “Diorama Series” of vacuformed ready-made diorama bases and structures. This one, kit number 36047, is “Country Road” with a broken down cut stone wall in the background and a small farm cart in the foreground. I was surprised to see that this kit was number 47; I didn’t think that many of this particular series had been done. A quick peek at their website reveals that they have 42 different “Diorama Series” kits available at this writing with another 6 in the planning stages. That only lends additional credence to something I have heard many times in the recent past but that bears repeating; this is a great time to be a modeler whether your particular bent is armor, figures, dioramas, ships, or even wingy things! The kit comes packaged in the usual slip top box from MiniArt, sturdy bottom tray and very flimsy top cover. Inside you will find two vacuformed pieces and one injection molded sprue. The two vacuformed pieces make up the base of the diorama; one is the groundwork and comes almost ready to go. The groundwork base will need to be trimmed about 1/4 inch of the small flanges on three of the edges which should prove to be an easy task for anyone with a hobby knife. The other vacuformed section has the front and back of the broken down stone wall that will also need to be cut out, sanded flush, and glued together. Both the stone work and the large base piece have the small dimples that are part of the vacuforming process and will need to be sanded flush or cut off. The one injection molded sprue is for the 19 piece small farm cart which is very well done. It is the same cart that MiniArt released as kit #35542 (Reviewed here). I was pleasantly surprised to find that ejector pin marks have been completely eliminated. Still a few pesky mold seams that need attention, but only on a few pieces. I am not normally a fan of molded in wood grain, generally it is much too heavy, but the body of the cart has what may be the best rendition of wood grain that I have ever seen, and it is on both sides which is not always a given. One small drawback is no instructions (although this may be a pre-production review sample, production kits may include instructions) for the cart; however a careful study of the box art should give you a pretty good feel for where everything goes. If you want to show any of the traces you will need to add those as they are not provided. With the huge number of possible locales for this kit the possibilities are virtually endless. You will want to add a bit of vegetation most likely, the box art shows a scraggly tree which is not included which they state clearly on the box. All in all this should prove a popular item in hobby stores around the globe be they brick and mortar or internet stores and I’m guessing more than a few of these will end up on the table at a model contest near you. If you are not into the whole contest scene this makes a quick and easy way to display your next masterpiece, it sure beats just sitting a vehicle on a shelf. Highs: Easy solution to a diorama base. Very well done farm cart and groundwork with all the detritus molded in that you would expect in a combat environment. Lows: A bit pricey. No vegetation included. Verdict: I really like the MiniArt vacuformed kits and this is no exception. Should look great with a bit of grass and some paint. Good review, though as pointed out, the lack of vegetation really kicks up the price for what is a limited array of scenarios: soldiers or a very small vehicle. Good review Rick. Looks like another winner by MiniArt. In one way Im glad it doesn´t include vegetation ... they would all end up looking the same. What modeller doesn´t have the basic materials to add to this? We are given a complete base with background and a pretty nice detail/filler ... do we really expect companies to supply everything? Where does it stop? Will we demand paint and glue to complete the scene next? In a way, this is two kits in one, where their cart is available seperatly, which might explain the higher price. I imagine this will be a lot cheaper in time to come. Adding the cart gives those who want to copy the artwork that possibility, and those who dont, can use the cart in any other scene they choose. Its a useful little item that could full out any dio or vignette. The little dimples have been present from the start. I mentioned them in the Ukranian house review many years ago. They do appear to be more when there is more detail per area. In all honesty, they are not hard to remove. I usually slice them off with a small chisel blade. If this leaves a small hole, it can be filled from behind with putty ... so even a beginner can manage this. Id take this route any day, rather than having to remove a huge resin casting-block on the back side. 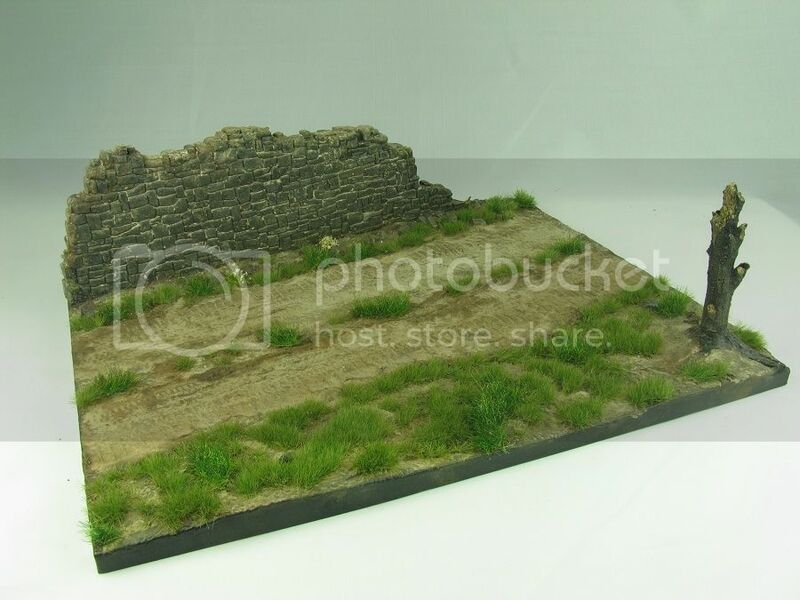 In my opinion, this is nothing more than a simple muddy road with a small wall, which again any beginner modeller could scratch build, so its not a "must buy". But what it does offer is a huge time saver and as Rick says "it sure beats just sitting a vehicle on a shelf". If this was my review Id probably give it an even higher score, rewarding what it is, not deducting from it for what it isn´t ... but thats me. We all see things differently, but luckily we are presented with enough details to make our minds up ... which is why reviews like this work. To me this is MiniArt's best diorama base to date, it has plenty to catch your eye, the base is a decent size, it can be a scene from just about anywhere in Europe and possibly a fair proportion of the US and you can pick a time period as well.